As you would expect in a central European country that has has significant wealth in its past there are a large number of period apartments with plenty of features and high ceilings. These apartments were purpose built as town homes for the aristocracy rather than apartments converted from town houses as can be seen in Britain. The post war years saw massive building programmes under the solcialist government with massive estates of concrete blocks. Ironically these are now some of the best buys on the Polish market. 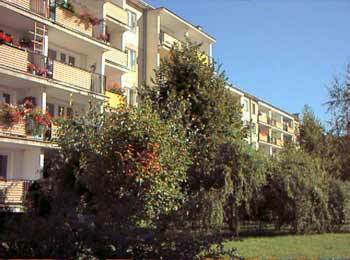 From the late 1980s onward the style of new apartment blocks from the outside is little different to anywhere else in Europe. The period style block usually has high ceilings, cornicing, wood doors and panelling and all the other trappings you would hope to find in the ex home of an aristocrat! These buildings must, however, be put in context. During socialist rule many were given to "The People" at a very low rent and both the flats and the blocks fell into disrepair. Buyers should tread carefully when purchasing an entire block to see if there are still sitting tenants living there. In some cases they have the right to stay at a fixed low rent until their death, or even the death of their children. Purchasing such a block could leave you with expensive maintenance duties, a small income and no rights on the building that you own. Many of these blocks have been successfully purchased by developers and renovated. 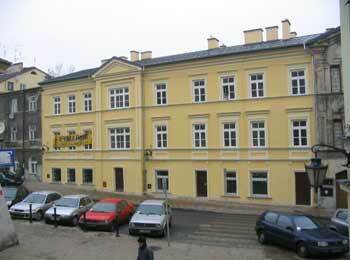 They make fantastic and impressive places to live or rent to business men and women. On a practical note these apartments are usually located in blocks with a lower ground floor that is given over to storage. Every apartment usually has a cupboard on this floor for storing old furniture, etc. On the landings there is often an additional cupboard for keeping bycicles, prams, etc. Its a practical idea absent from many modern blocks! Almost every apartment has a balcony of some shape or size. There is a fundamental difference between the housing policies of Western governments and those of Poland during the post-war concrete block building period. While in the West estates were built of the socially poor and became the ugly council estates that are still so unpopular, in Poland the poor got the period properties and the new estates were built for people with at least some wealth. These complexes were usually run on the same principle as a housing association, shared ownership. The result was very ugly concrete estates with very proud owners. Even today these estates remain litter free and with hardly any vandalism. Furthermore with less pressure on land the blocks were well spaced with plenty of green space, childrens play areas, pedestrian and cycle paths and so on. In recent times a national programme has given most blocks a face lift with the gray facade being replaced by painted colours. In general they are well built, well run and excellent value for money. Even apartments in an un-modernised condition can be easy to rent out, especially in student areas. Moreover because of the over-optimism of socialism the infrastructure is, or was, far ahead of its time. The governments expected all the people would have a car and so the road and parking system was built with this in mind. The construction of modern blocks (the late 1980s on) is slightly different. Usually there is a basement garage level with either open plan parking or individual garages. 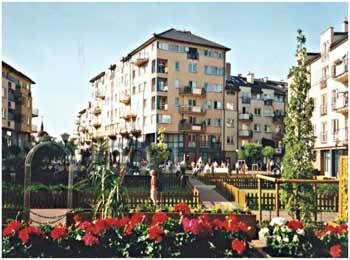 Apartments then start from the raised ground floor or ground floor upwards. Unlike their concrete predecessors however there is now a greater pressure on land space and so some new developments have little green space and parkland surrounding them. 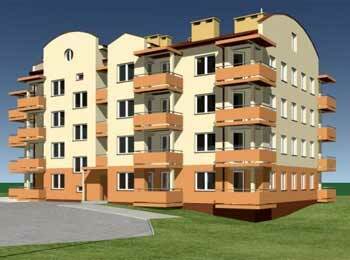 Buying off plan in Poland is slightly different from other countries. The reservation and exchange of contracts is generally the same. You will put down a small amount to reserve the property and then have two to three weeks to exchange contracts. Between exchange and completion however you are usually required to pay installments rather than paying the balance on completion. As such if you are raising a mortgage for the purchase it is essential to choose one that will pay out as the construction process advances. You should also be aware that most off-plan units are sold as shells without flooring, kitchens or bathrooms. This does not have to be a problem as Mamdom provides a Project Management Services to help foreign buyers fit out shells.